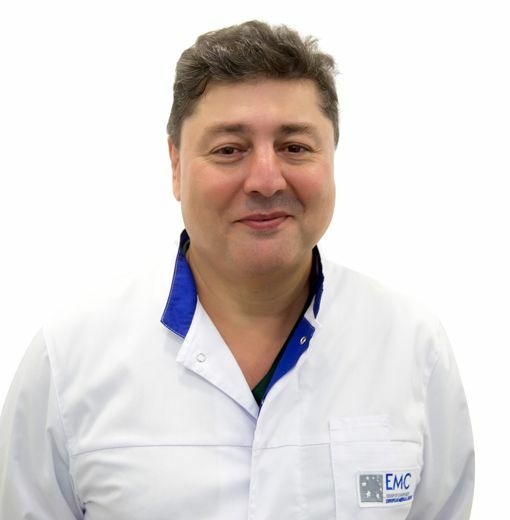 RZAEV Farkhad, Doctor EMC. Make an appointment, ask a question. Head of the Department of complex cardiac arrhythmias and pacing in the City Clinical Hospital n.a. I. V. Davydovsky, PhD, member of the Presidium of the all-Russian scientific society of Arrhythmologists. In 1994, he graduated from the pediatric faculty of the Russian state Medical University. n.a. Pirogov in Moscow. Since 1991, he worked in the Scientific Center of Cardiovascular Surgery n.a. A.N. Bakulev - initially as nurse; from 1994 to 1996 he held a residency in cardiovascular surgery; from 1996 to 2015 - a surgeon at the Department of Surgical Treatment of Tachyarrhythmias, deputy head of the Department of tachyarrhythmias in clinical care. From 2015 to 2017 - the City Clinical Hospital n.a. I. V. Davydovsky, an x-ray surgeon of endovascular methods of diagnosis and treatment at the Center of Atherothrombosis. Since 2017 to present – Head of the Department of complex cardiac arrhythmias and pacing at the City Clinical Hospital n.a. I.V. Davydovsky. Since 2004 – PhD (medicine). Thesis on the topic of "Low-energy endocardial atrial defibrillation. Technique, methods and results of clinical application». He took an active part in the development of algorithms for discrimination between supraventricular and ventricular tachycardia in multi-chamber cardioverters-defibrillators. His doctoral thesis is devoted to the interventional treatment of atrial fibrillation, including in patients with congestive heart failure and sinus node weakness syndrome. Lecture cycles on cardiac arrhythmias, ventricular arrhythmias, atrial flutter and fibrillation, supraventricular arrhythmias, bradyarrhythmias (advanced training cycles for doctors, field cycles). There are more than 200 publications, 29 articles, 4 chapters in monographs, clinical recommendations of the all-Russian scientific Society of Arrhythmologists on EFI, catheter ablation and the use of implantable devices (5 editions - 2005-2017). Citation index (e-library) – 10.